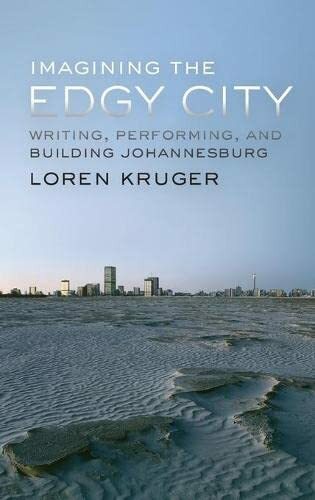 [PDF] Imagining the Edgy City: Writing, Performing, and Building Johannesburg | Free eBooks Download - EBOOKEE! Description: "All roads lead to Johannesburg," remarks the narrator of Alan Paton's novel Cry, The Beloved Country. Taking this quote as her impetus, Loren Kruger guides readers into the heart of South Africa's largest city. Exploring a wide range of fiction, film, architecture, performance, and urban practices from trading to parades, Imagining the Edgy City traverses Johannesburg's rich cultural terrain over the last century. The "edgy city" in Kruger's exploration refers not only to persistent boundaries between the haves and have-nots but also to the cosmopolitan diversity and innovation that has emerged from Johannesburg. The book begins with the building boom, performances and uneven but noteworthy inter-racial exchange that marked the city's fiftieth-anniversary celebration at the Empire Exhibition in 1936. This celebration rapidly gave way to the political repression and civil unrest that characterized South Africa from 1950 to 1990. Yet poetry, drama, fiction, and photography continued to thrive, bearing witness not only against apartheid but to alternatives beyond it. In the late twentieth century, the not quite post-apartheid condition fired the artistic imaginations of film makers as well as novelists. Urban neglect, rising crime, and the influx of migrants inspired noir cinema-like Michael Hammon's Wheels and Deals-and fiction about migration from Achmat Dangor to Phaswane Mpe, and in the twenty-first, urban renewal has produced public art that incorporates the desire lines of newcomers as well as natives. Alongside well-known artists such as Nadine Gordimer, William Kentridge, and David Goldblatt, the book introduces many artists, architects, writers, and other chroniclers who have hitherto received little attention abroad. Ultimately, Johannesburg emerges as a city whose negotiation of the tensions between incivility and innovation invites comparisons with modern conurbations across the world, not only African cities such as Dakar, or other cities of the "south" such as Bogota, but also with major metropolises in North America and Europe from Chicago to Paris. A multi-faceted work that speaks to scholars in urban studies, literature, and history, Imagining the Edgy City is a rich example of interdisciplinary scholarship at its best. No comments for "[PDF] Imagining the Edgy City: Writing, Performing, and Building Johannesburg".